--Have you got your popcorn ready? In the words of the immortal Ed Whalen, Saturday night should be a "ring-a-ding-dong dandy". The 5-0 Stamps bring their show into what will be a sold-out Mosaic to take on the 3-2 Riders on what should be a gorgeous night for football. What more do you want? It should be a game where points come at a premium. Make no doubt about it, the Riders are in tough and they are the underdog for a reason. They have shown that when they play smart football, they are a very good team and a tough one to beat. The problem is they are playing a team that can make you make mistakes in a big hurry. The /=S=/ can pull off the upset, but they will have to have a lot of things go right for them. In a thanks Captain Obvious statement, they will have to play their best game of the year to get the "W"
--Duron Carter told reporters this week that it is getting somewhat annoying with everyone giving him their two cents on the team and his playing status when they see him in public. He said he can't even go out for a meal anymore. If the truth be told, that story is somewhat over as we know Chris Jones isn't going to change his stance. I still think the move is a wrong one and so do many others, but Jones is the one calling the shots like it or not. The only question that has some validity is one Derek Meyers asked on the Sportscage this week and one he has asked before: What does this do to any bonus money Carter had in his contract? He isn't going to get 100 catches or 1000 yards or 10 touchdowns this season. He won't be a Western Division all-star or a CFL all-star. One has to think there is some extra $$$$ in his contract for getting to certain levels and having certain plaudits thrown your way. I wonder if it will have any effect on what happens the next time Duron needs to sign a new deal here if Jones is still in charge. --Is it fair to ask what the Riders record would be if Zach Collaros had been the quarterback of record for all 5 games? At the end of the day, I think they are 4-1 and not 3-2. Is there really that much of a difference at this time? --Yes, he didn't have a lot of time to learn, but after hearing he would play and seeing the game was rather one-sided near the end, where was Johnny Manziel? Is there a story here that we aren't being told? The reality is Johnny Football couldn't get on the field for a 2-3 football team and was traded. Yes, the quarterback of that 2-3 team had a nice start to the season, but still. I'm starting to wonder here if Hamilton found out what Montreal has found out and that this guy doesn't live up to the expectation and that the progress report isn't as good as what Kavis Reed may have been told, If he doesn't get the start next week and produce, start asking questions folks. Then again, it is Montreal and there is no sign to make one think the tire fire that they are is going to be put out anytime soon. --Damn the UFC for having an event in Calgary on the same weekend as a Riders home game!!! 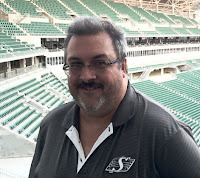 A Rider game in Calgary would have had this blogger at both McMahon and the Saddledome this weekend. --As the end of the season approaches, it would seem as if Reginans are starting to take in some Red Sox baseball at Currie Field. It was nice to see 1000 people at the park for their game against Yorkton on Tuesday night. Playoffs are a comin and that should mean some nice gates as well. --Speaking of gates, the league announced eight more games will be played in the regular season starting next year making it a 56 game season instead of 48. That translates to an extra four home games. That should be good for league teams across the board when it comes to extra revenue, but I don't like the fact playoff series will now all be a best of 3. If you have to have players back at their respective schools on time, it is something that has to be done. For the betterment of the league, its OK, but put me down as not liking a best of 3 final. --The Carolina Hurricanes are going to do what the Sabres and Stars have done before them. They are going to simulcast their TV broadcast on the radio. That doesn't work all the time especially when it comes to showing a replay which as you know you can't see on radio.. Let it also be said that if the Oilers decide to scrap their radio guys for a simulcast involving their TV crew that I will just mute the sound when watching. Thanks to the Google Mini, I quite often find myself listening to the call of Jack Michaels and Bob Stauffer as it is. --Jarome Iginla has called it a career. Being an Oilers fan, the sweater he wore for much of his NHL career nauseated me, but one can not deny what type of player he was and that he will be going into the Hockey Hall of Fame as soon as it is time. Is he the best ever Flame? Sorry Theoren Fleury fans, but I think we know the answer to that. --The Globe and Mail ran a story Wednesday suggesting a Calgary Olympic bid would call for events in Whistler and Edmonton. Those events in the Alberta capital could include hockey at Rogers Place. ????? A marquee event at the Winter Games not being entirely played in Calgary, but shared between them and Edmonton instead. What happened to the narrative that another Winter Games would bring the city and the Flames the rink they desire oh so much. One that would insure their future in Calgary for quite a while and perhaps do for the city what Rogers Place has done for Edmonton. If only some games are to be played there, they will go at the Saddledome as there is no need for a brand new facility. Hmmmm!!! The IOC has no issue with the Dome and said so early this year.